At the age of three in 1974, our family moved to Austin, TX. The first thing my parents did was join a wonderful Episcopal Church in which I spent my entire childhood. My parents were diligent about bringing me to church every Sunday and making sure I “robed” as an altar server/acolyte. My mother grew up Methodist, a denomination with historic connections to the Church of England (Anglican). My dad was a cradle Episcopalian who was spiritually formed by the 1928 Book of Common Prayer. At the age of five, I was accidently burned from the flames of a candle. My injuries were so severe that I spent three months in hospital rehabilitation and salt baths. I was thankful that my dad caught the fire in time and rolled me on the ground to extinguish the flames. My parents stayed by me and loved me through that difficult time. After three days, the doctors were not certain that I would survive, but by the grace of God, I survived and even thrived. I remember that our dear Episcopal priest visited me regularly at the hospital, and my best friend Holly kept me company as I healed and recovered at home. My Episcopal Church family prayed over me regularly and supported my parents in a number of ways for which I will always be grateful. I was confirmed in the Episcopal Church at the age of nine though I didn’t fully understand what confirmation meant. I thought it was something everyone did at a certain age. In the 1970s, girls started serving at the altar (see picture) in Episcopal churches across the nation. This was happening in other parts of the Anglican Communion, but the Episcopal Church USA (ECUSA) became the gateway for modern innovations, such as the ordination of women to the priesthood, something that had never been practiced in historic Christianity. 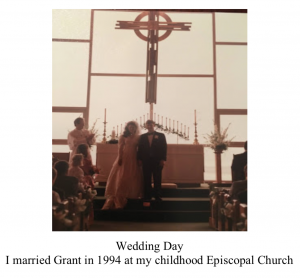 In 1983, at the age of twelve, I loved serving at the altar with a new a godly Episcopal priest until I graduated from high school in 1990. That priest expended much time and energy at the national level trying to protect our parish and diocese from the inroads of modernism, pro-abortion, and gay activism. The Episcopal Church was attempting to be “prophetic” by introducing women’s ordination, radical changes to the Prayer Book (1979) and idolizing “diversity”. Girls serving at the altar tended to lead us in different directions. Some sought ordination. Others simply wanted to be near the presence of the Lord. Thankfully, for me, altar service lead to loving Jesus and the Eucharist Feast. 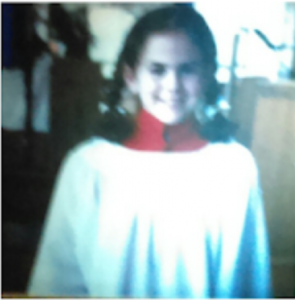 Me as an acolyte/altar server in 1980. In the late 1970s, I experienced changes in the liturgy and the worship music. Both were more contemporary in style and in the language. This is the time that women’s ordination started, and it was the Episcopal Church USA that opened the doorway to this dangerous modern innovation. I didn’t understand that women’s ordination to the priesthood was not Scriptural and that it departed from the historic Christian faith. Throughout my elementary and middle school years, I picked up on certain doctrines about salvation, baptism, and Communion. I was taught that salvation was ongoing and that someone could fall from grace if they gravely turned away from God and never repented. Although I didn’t know what sins of grave matter were, I heard occasional references to the Seven Deadly Sins. I was also taught that water baptism was required for salvation and that the elements of Communion somehow changed at the altar, but I wasn’t sure how that mattered. I didn’t understand that one’s heart needed to be prepared to receive Communion, that sins should be confessed and fully repented before receiving the Eucharist. General words of confession became less and less evident with the 1979 Prayer Book. After my ten years of altar service, I earned this custom-made James Avery cross. It is now on a rosary that I use regularly to pray. In my teen years, I experienced moderate to liberal teachings from the youth leadership on sexuality at the Austin Episcopal diocesan-wide level. This was the trend in other Episcopal dioceses as well. Sadly, throughout my active church involvement, I never opened a Bible or learned much about the Christian faith at my church youth group. Thankfully, parts of the 1979 Prayer Book retained Scripture which I memorized and have never forgotten. This played a huge part in my later faith journey. In 1990, I moved into the freshman dormitory at Baylor University. I was soon approached by Evangelical Protestants who lead me to a radical conversion experience. I had never seen or heard of Billy Graham or his style, but this all woke me up to God’s Word and reading the Bible for the first time. To read the whole story with many more pictures, click HERE. Julie I loved reading your story, I am also a former Baptist now enjoying the fullness of the Catholic church. I was especially moved by your reference to the dying thief on the cross. What a wonderful Lord we have! Next post: Ready to Start Studying the Bible in 2019? It’s Time to Prepare Now!